Who: Me (Keane). PiC (Partner In Crime). And a cast of thousands. Where: Florida. Kidani Village, Disney World; and Inn at the Beach, Venice Island. When: Dec 2 through Dec 13. Why: Because we *like* you. Em. Oh. You. Ess. Eee. Oh, and if looks like sarcasm, it probably is. Even if it doesn't look like sarcasm, even money says it is. Finally, nothing in this report should be taken seriously. If you take something seriously, it's not my fault. March. After a non-productive cough that won't go away, I'm admitted to the hospital and after 5 days of being poked, prodded, x-rayed, scanned, tortured and tormented, I'm diagnosed with Non-Hodgkin's Lymphoma. 9 days after being released by the hospital and my first chemo session, I'm re-admitted for pneumonia. April. I'm finally paroled out of the hospital on the 6th, but am on heavy antibiotics with a few more chemo sessions to look forward to. Every third Wednesday is going to screw my life up for a while. June. The cancer is receding, but they're not going to stop my chemo sessions. The Doc asks what I'm going to do with the rest of my summer, and I immediately reply "I'm goin' to Disneyworld!" Addiction. It's a terrible thing. Mid-June. So, I decide I want to go to Disneyworld in December, but PiC says she can't, December is too busy a month to get away. I threaten and cajole, but she ain't budgin'. July. I want to go to Disneyworld in December, but PiC says she can't, December is too busy a month to get away. I threaten and cajole, but she ain't budgin'. August. I want to go to Disneyworld in December, but PiC says she can't, December is too busy a month to get away. I change from threaten and cajole to beg and plead. I think I'm softening her up. September. I want to go to Disneyworld in December, but PiC says she can't, December is too busy a month to get away. I pull the final card. I'll do some database work she needs done. She knows I can do it in a couple of days. She knows it'll take her weeks to do the same work. Yes, it's extortion. But extortion is such an ugly word. Let's call it 'aggressive negotiation'. October. I want to go to Disneyworld in December. PiC actually agrees. Is she doing this for me, or because she needs that database work done? I suspect it's the latter. I don't care, I'm going to Disneyworld in December! But dates don't line up well, and it takes a bit more negotiation and discussion to settle on some dates. I'd like to be there during the RADP meet. The week after is a possibility too. October and November. Planning the trip. October 1. In a RADP newsgroup thread about Disney changing their hotdogs, I casually mention that I keep seeing the Varsity in Downtown Atlanta from I-75, and am going to stop someday, and within two posts (Lisa and Rodney) we're going to meet. So I have something on my list of things to plan and do, before the list even exists yet. Now, I've always said I can't plan my WDW trips that far ahead, but I've never planned one six weeks out, either. I wasn't hopeful on getting a decent room, if at all. Wrong. Well, not wrong right away. Well, not wrong if you're willing to pay $250+/night for a room. October 21. A Savanna view Kidani studio becomes available Dec 6-10. Done! Not only is it Animal Kingdom Lodge for DVC'ers, but I haven't been there yet. (I do try to stay someplace new every time I'm there. See my website.) But the two days previous, Friday and Saturday (Dec 4 & 5), are a tough ticket. If something doesn't come up by 30 days out, I'm going to start searching single days at resorts. I really don't want to do that. I mean I really, really don't want to change three resorts in three days. October 28. PiC informs me she was informed that her office is going to be moved the first week of December. The problem is, she doesn't know if the first week of December is Nov 30 to Dec 4, or Dec 7 to Dec 11. It makes a difference. October 30. Dec 4 & 5 open at Saratoga Springs. A one bedroom Villa at $264/night, but still cheaper than a Kidani Studio. Booked. I've been to SSR before, but it's better than the 2 bedroom, $419/night rooms that keep appearing (and disappearing) at SSR and Key West. At least I'm booked into the days I want. I check Mickey's Very Merry Christmas Party (MVMCP) tickets. The last AP discount night is Dec 8. Almost buy the tickets, but the only choice for delivery I get is will-call. Maybe it's some Java thing, but it happens under IE and Firefox on two different machines. I send e-mail to guest services asking why. November 1. All sorts of things open up at the Grand Floridian; Lodge Tower ($384/night), Theme Park View ($404/night) and Garden View ($298/night) rooms. I decided I didn't want to stay at the GF in 2007 after eating at Citricos. Oh, I'd eat at Citricos again, but after touring the Floridian, I decided it's just too high falootin' a hotel for me. With reluctance, I pass. Get mail from BYPT Jenny about not having a whining update out, and instead set up dinner for December 9, the only days our trips will overlap. Jenny, Jennette, PiC and I have a date at Cape May. That was easy. November 2. 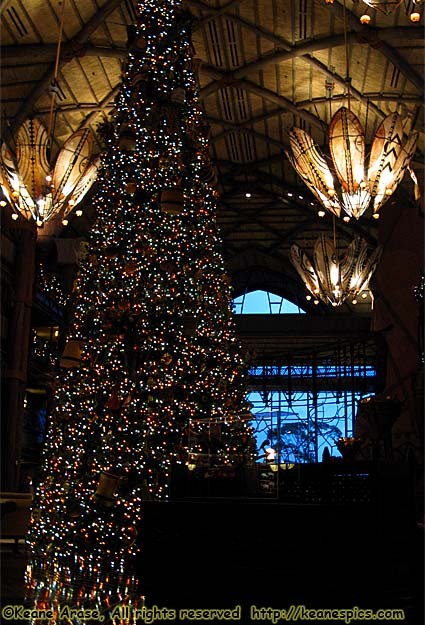 Animal Kingdom Lodge/Club Level opens up on Dec 4 & 5. Booked that and cancelled the 1-bedroom as fast as my fingers could punch the buttons on my phone. My rooms were now less than a mile apart. :-) I could probably stop looking now. I mean, I've checked so many times that I've memorized my AP number. November 5. Did you actually think I'd stop looking? Two rooms for the Poly opens up for all six nights. A Park View/Club room for only $670/night, and a garden view room at $254/night. I can't justify the $670/night, and the garden view would end up a monorail view with a side of dumpsters. Besides, I'd really like to see Kidani. And I'd really like it if I didn't have to move. Send mail to Steve Russo, and arrange to have a cocktail. Find out his trip and mine pretty much overlap, and he'll even be at Jambo House starting that Thursday. Of course I'll be gone by then. November 6. The Disney Gods listen! Four weeks out, and all six nights at Kidani opens up at the same rate as my four night reservation. Done! My poor credit card has 4 charges and 3 credits from Disney after it's all said and done. Four hours later, I get mail from Guest Services telling me to call for the party tickets. Too late! November 14. PiC completes her half of the trip planning. Two nights in Venice, Florida, at Inn At The Beach, the #1 rated hotel on TripAdvisor. PiC calls the place instead of using one of the booking services, and found you can only get certain rooms by calling, and aren't available on the booking sites. So, we're right on the beach, second floor. Of the rooms that face the Gulf, the first floor is a "Beach View" the second floor is a "Gulf View". I'm hoping I won't even have to leave my room to see a typical, beautiful, sunset over the Gulf. >Thank you for contacting the Walt Disney World Resort. He could have just said, "We're just using up the paper stock we have, and didn't think Virgin would get kicked out early for Diana..."
November 24. I get another set of Disney propaganda for my stay at Kidani, and it has the same Virgin Megastore mention. lol! By the end of November, Michelle's reason for not going goes away, and Fizzie's going to come with her daughter. The First Annual RADP Varsity meet is on! End December 2009 Trip Report - Part 1.